Kennebunkport’s 38th annual “Christmas Prelude” is the ultimate seaside holiday celebration and a great way to kick off the Christmas season. Prelude will remind you of Christmas’ of the past, when the whole town is transformed with bright lights, bows and boughs and everyone comes together to celebrate this festive time! 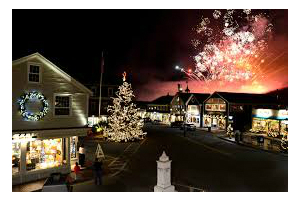 The Christmas Prelude celebration began in 1982 and has since become one of the most popular annual events in Kennebunkport. Visitors come from all over the world to take part in festive activities for all ages. The celebrations start off with the Dock Square tree lighting, where everyone gathers around as carolers take the stage to sing our favorite Christmas tunes. Other events include historic house tours, sleigh rides, concerts and more. Kids will love watching Santa arrive in town on a real Maine Lobster Boat! Shoppers will delight in the steals and deals around town, with stores offering great seasonal discounts for those looking to get a jump on their Christmas shopping! Many shop owners and art galleries will even serve up cookies and fresh cider to warm up visitors as they browse. There are also several local craft fairs that offer unique and hand made gifts from local artisans. With so many festive ways to celebrate the holiday season, it is no wonder that Christmas Prelude has gained a large amount of media attention. HGTV recently featured the annual Kennebunkport celebration as the “#2 Christmas Town in America.” Prelude celebrations have even begun spreading to nearby towns Kennebunk and Cape Porpoise, which constructs a Christmas tree made out of lobster traps!